He ask'd, and hoped through God. Do thou the same. This list may not contain all of the names of K Troop's dead. If you know of a K Trooper who should be on this list, please send feedback.. Grateful appreciation is extended to Jim Murray for compiling the master roster of all of the 11th ACR KIAs and more recently, Allen Hathaway for continuing the work. What Was The Most Dangerous Job In Vietnam? On May 21, 1967 K Troop suffered its worst single day casualty loss for the entire war in Vietnam when 16 men of K Troop were killed. 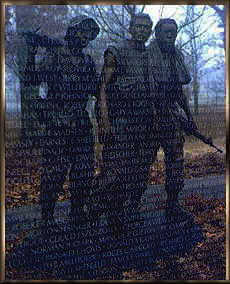 GO HERE to read the story of their courageous battle for survival as they fought to defend against the enemy's attack. May 21, 1967 - William P. Centers, Jr.
June 19, 1967 - Raymond D. Crowder, Jr.
June 19, 1967 - Edward Lee Fails, Jr.
June 20, 1969 - Joseph Wayne Sell, Jr.
June 26, 1970 - Wesley Charles Howley, Jr.
July 21, 1967 - Roosevelt C. Curley, Jr.
August 14, 1967 - Angelo Cesare Raptis, Jr.
October 31, 1968 - Robert M. Press, Jr.
* The 11th Armored Cavalry's Veterans of Vietnam and Cambodia counts four members of the 11th ACR as Missing In Action (MIA). Walter Stephen Simpson is one. The other three are, Walter Melvin Pierce, Peter Charles Forame and Thomas William Skiles. More Info. For the complete list of all 11th ACR KIAs from 1966 until 1972 by year, go here. Individual profiles contain terms, abbreviations, ranks and anachronism that are not easily understood. To learn more about these terms visit the the Honor Roll's Glossary Of Terms.